Businesses of all shapes and sizes will outsource their work to contractors thanks to inherent benefits like staffing flexibility, lower costs, and ability to hire specialized labor for just when and where it’s needed. However, for all these benefits comes one significant drawback when it comes to contractor management: the loss of control. Where an owner client can easily supervise and monitor employees, their work, and progress, contractors enjoy a certain amount of autonomy. In fact, if an owner client interferes too much in their work, they risk making a contractor appear as an employee for which the law requires payment of payroll taxes, worker’s comp premiums, and much more. However, without any oversight, the owner client can easily feel frustrated, as they may not have any assurance that the requirements they set in place are being met. So, to balance the fine line of ensuring protocols are in place without overstepping the legal barrier between contractor and employee, a great deal of owner clients/businesses hire a contractor manager. A good contractor manager and contractor management system, of course, goes beyond just ensuring all the basic legal classes are met. Another major facet of this is ensuring the safety and health of everyone involved in a project — contractors, employees, and members of the public — and to minimize any company risk. This is critical as employing independent contractors requires placing personnel who are unfamiliar with a building or worksite’s hazards into vulnerable locations. Likewise, on the other hand, the contractors themselves may bring in or open the door to potential new hazards, such as the introduction of chemicals are an electrical outage. It is, therefore, vital for contract managers to be kept up-to-date on all of the key safety requirements of a given industry, so that they may know what is or what is not safe and legal practices by a hired contractor. Preparing materials for contractors and their employees so that they may safely provide their services with a thorough knowledge of a facility. This includes ensuring the know all of the relevant risks, facility safety controls, and procedures as well as what they should be expected to do in so far as their own personal safety procedures. Ensuring that a hired or potential contract has the correct insurance coverage and limits and that their certification is in line with the owner client’s requirements. Appropriately documenting the entire contractor screen and selection process. This ensures that if something does go wrong, the owner client is not held liable as the correct protocols were enacted. Operate as a project liaison between the owner client and the contractor. This responsibility and its facets may depend upon the owner client and/or the project, but because a contractor manager is often the first person to initiate communication between the owner client and the hired contractor (via the research and vetting process); they offer the best platform for communication throughout a given project. Appropriately recording how a project is going underway and highlighting key areas where work may be improved. 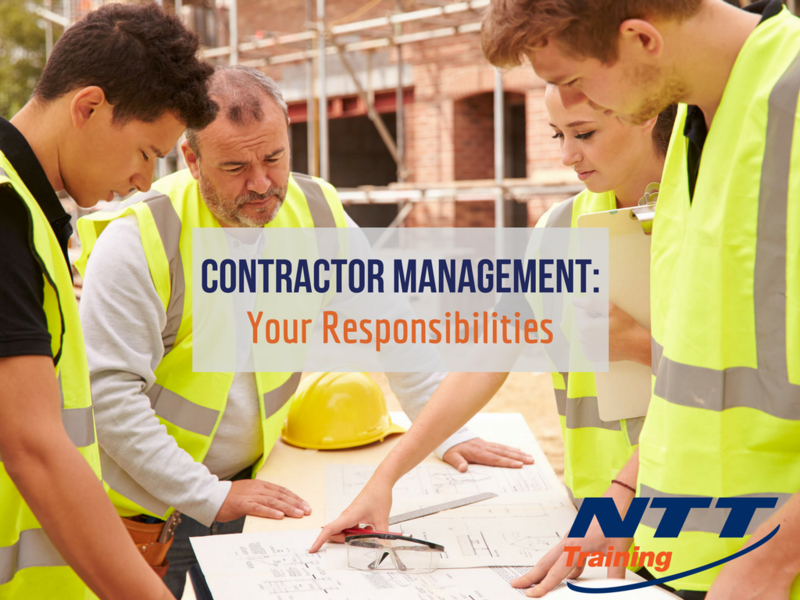 A contractor manager holds a key position in a given business and is an excellent career path for individuals who are passionate about problem solving, have excellent communication skills, an eye for detail, and an interest in safety. For more information contact us today at NTT Training.